BMW Group increased its sales of plug-in electric models in the U.S. by 20.2% in June. In total, the German manufacturer delivered 2,253 plug-ins under the BMW and MINI brands, which stands for roughly 7% of total sales in the country (one of the highest results for any established manufacturer). The 7% share is not the record, as in March some 12% of all BMW were plug-ins. In the U.S., BMW Group offers several models: BMW i3 (and i3s), BMW i8, BMW 330e, BMW 530e, BMW 740e, BMW X5 xDrive 40e and MINI Countryman plug-in-hybrid. The top-selling plug-in from BMW usually was the i3/i3s, but if you check the results there is has not been much positive progress in terms of sales of the i3 over the past year, while the BMW 530e and BMW X5 xDrive 40e are not far behind in the table. 37 Comments on "In June, Plug-In Electric Cars Accounted For 7% Of BMW U.S. Sales"
i3 sales are likely to decrease in the next months as people are waiting for the 120Ah version that will be available in November this year. Exactly. Why now wait a few months for much better range. There are enough commercial customers. We are not going to see a dip just because the car gets another update. I really hope they do drop because if that happens then they will have to do a fire sale on the old i3s… and i will be there to pick up an old model lease for cheap. Many people prefer the small footprint and nimble parking ability of the i3. Others are intrigued by the high tech innovative CFRP for a car in this price range. I definitely have plans to order a $60K i3s soon, instead of a model 3. The only thing those two cars have in common is that they are electric. Why would you even compare them. The BMW is a premium hatchback and the Model 3 is a entry level sedan. While it’s true that these aren’t direct competitors, the fact that Model 3 has so much more to offer for a similar price highlights how much the i3 is overpriced. eject is spot on there. Just look at the materials of the i3, or even the tight finish. Tesla is a young company, but still many years till they can produce anything on german level. BMW is a premium hogwash! What the hell is so premium about it other than its price. Go see one first and then talk about it. It’s ridiculously expensive and no one would drive it in US if it wan’t for the good leases and the generous discounts. 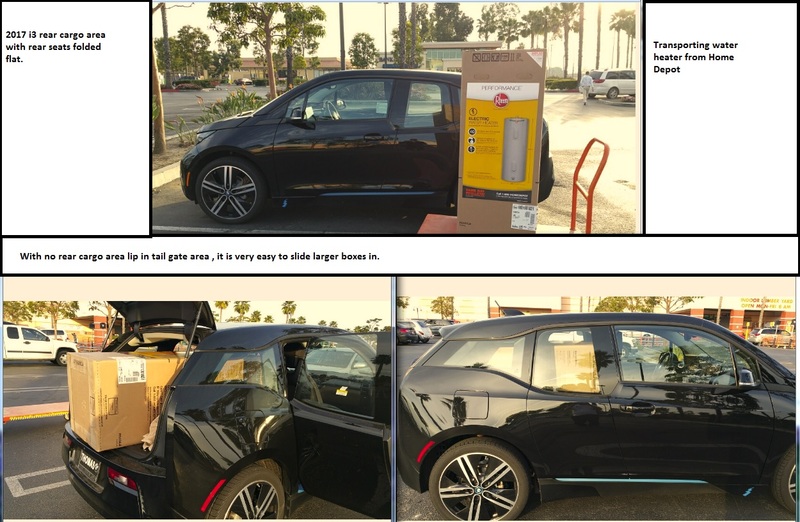 We live in the U.S. and bought our 2013 i3 BEV rather than leasing it because we tend to keep our cars for many years. We prefer a light, compact, RWD hatchback, not a larger, heavy sedan like the Model 3 or FWD like most EV’s. Living on the ocean, we also value the i3’s more expensive, light, corrosion-resistant construction of the i3 (aluminum/CFRP/thermoplastic) over the less expensive and heavier steel used in almost all other EV’s including the Model 3. I wish the i3 were a Honda or Toyota so that its price would have been lower and its reliability higher although we have had no problems with our i3 so far. But Honda and Toyota don’t seem interested in building an innovative BEV like the i3, so we bought what was available and that met our needs. Seems like a good fit in your case. I would be nervous, if out of warranty, when going in for repairs. Hopefully it’s better than the gassers BMWs. The i3 is a really nice car, but finds few buyers due to its high price tag and relatively low performance (acceleration and handling). However it is a very nice car. It finds a lot of buyers with heavy discounting. Most in CA are getting deals like 10,000 off from the power company, 7,500 tax credit, and another 2,500 from state tax credit, so think 20k off MSRP. For about $30k it is an incredibly nice car. I bought a used i3 REx Tera package (dark brown leather interior). Love it. I would not pay the same as an LR Model 3 if I were buying new, but I feel the car is worth the price if someone values qualities that aren’t outright acceleration and handling. The i3 is really well constructed, the Tera leather is very nice and overall interior is excellent, except for possibly the recycled plastic/kenaf fiber looks like raw fiberglass. Any car that can accelerate 0-60MPH in less then 7 sec is better then most need, and considering EVs 0-30MPH is better then 90% of ICE, this is more then sufficient. I had a sport car that was doing 0-60MPH in less then 6sec and you know what I don’t miss it one bit (yes, disclamer, I have a 2014 i3). So unless you can only accept a car that send your eyes rolling in the back of head every time you accelerate, that argument isn’t one. As for handling that car in nimble in the traffic, responsive and can turn on dim. So if your intend is to do racing on the weekend (and even there, plenty of video showing the i3 out doing many), that argument isn’t one. I love the i3 as well, but I also understand why it doesn’t have mass market appeal. I don’t need 0-60 faster than 7 seconds and as you say don’t mind the i3 handling, although it gets skittish on bumpy roads with regen. I love the turning radius, about 16.2 ft instead of 19.4 ft of Model 3 (meaning turning diameter is 6 ft less). It is so incredibly efficient, I am regularly blown away at how well it does around town (not so efficient on the highway). It probably is a better town car, but most people want a vehicle that can do everything. Carried a 55″ TV in mine last week, how will you do that in that M3? You find it goofy, I find it practical and its minimalist interior inspired many (including Tesla). I understand, you love the M3 for many good reasons, reasons not everyone shares. I have the 1rst generation i3 and Range isn’t a issue for me. I agree though, I did a comparison with my Clarity PHEV and Volt, the Volt could barely take a 55″ TV and the Clarity could not. However, the Clarity could hold far more luggage on a trip without impeding into the rear seat passenger area. 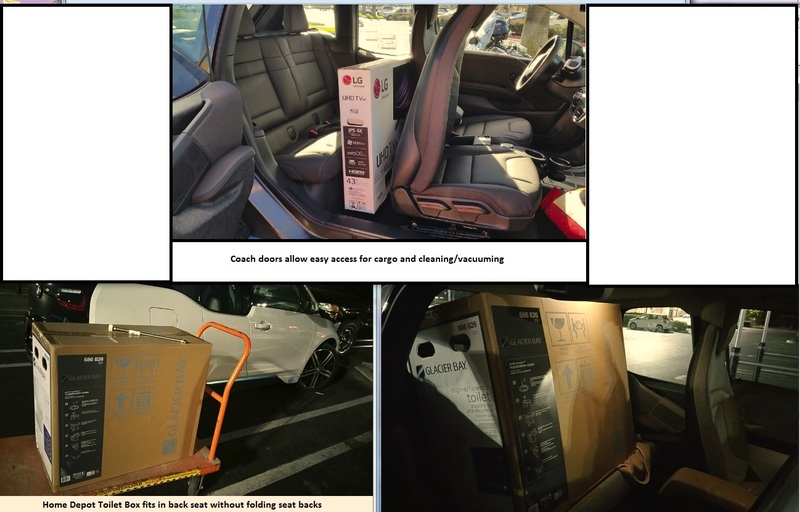 Model 3 with seats folded down can fit an air bed for a grown person… Why would it have any trouble fitting a 55″ TV? It might, I couldn’t find measurements on that opening, but it looks much larger than the one in my Clarity. Wonder if the Model 3 could fit a 40 gallon water heater? And I know you couldn’t fit a big Glacier Bay toilet box in the Model 3, loading it in the side door, without the seat even folded down! i3 is a premium car, typical middle class vehicle. Model 3 refers to a totally different market, typical working class vehicle. Most people prefer to lease such cars and you may be able lease several i3s for a single TM3 payment. It depends. The more different sizes and shapes of EV’s the better. Hopefully Model 3 sales drag UP other BEV sales as it works as a halo car for all other EV’s. The success of the Model 3 means nothing if it becomes the only dominant EV, the way the Prius took the majority of the hybrid market and then hybrids couldn’t break through into the mainstream. It is only truly successful if generations of new EV’s follow in similar volume as what we are seeing with the Model 3. “In June, Plug-In Electric Cars Accounted For 7% Of BMW Sales” assumes global numbers. “In June, Plug-In Electric Cars Accounted For 7% Of BMW Sales IN THE US” tells you which country such country specific articles are regarding. It’s in the boldface subhead as soon as you open the article. Not everything fits in the title, that’s why we have the subhead. Or “In June, Plugins Accounted For 7% Of BMW Sales in the US”. It is a vital part of information and it should not be so hard to remember to do even for articles regarding the US. If you have one single article you could point to that is solely about China, Germany or Norway where that is not obvious in the title then I will shut up. About this increase of plug-in electric car share in total amount of cars sold by BMW, I would be curious to look for the yearly increase (in %) of the number of BMW plug-in cars sold for period from 2012 to now for example, same with VW group and Hyundai group. I would not be surprised to see high increase percentages year over year (maybe 25-30% in some case). So it is rather ironical that those increases are full below the radar scope of retail investors but that comparable % of increase year over year at Tesla justifies a lot of hype and a stratospheric stock valuation. It might be explained but at first sight it seems illogical. Still lovin’ my 2014 i3 Rex, now with increased range! Looking forward to upgrading to the 2019 model and doubling the range! 2019 model will have double range in compare to 60Ah version. Please notice: 120Ah + REX will not be availble anymore! Has the 120Ah not being available with the REX been officially confirmed? Last I knew it was just the fodder of BMW forum post storms.